So, here it is: day two. I’m supposed to think or research a pattern that embodies this house – my house. My house of monkeys. I have a house full of monkeys, in case you didn’t know it. This is a tough one, as I don’t know that I could pick just one. I love the Perry pattern – I have to make one of those, but will probably wind up making 3-4: one for each person in the family. I continuously find patterns that I love, but always have to alter to fit or it’s perfect except for one thing, like it’s a sweater knit in pieces and I want it in the round. I always change some aspect of the pattern. A perfect example: Skelf. It is a terrific pattern, but mine doesn’t fit quite right. 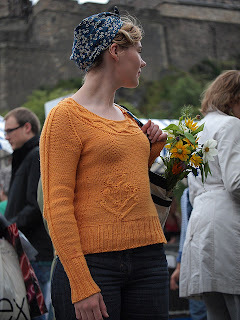 I’m going to reknit it, probably this summer, and hopefully it will fit. 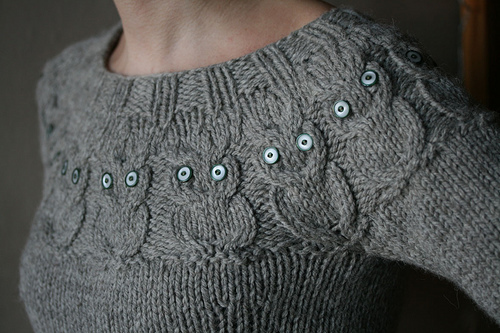 The Owls pattern is another example: great pattern and I love it, but not big enough. So, I have to resize it. Gemini? I have to rethink it, because I’m using 100% merino, rather than a linen blend. I have made a few things by the pattern, but not many. Even the latest FO, Koguchi (yes, I finished it this morning) got altered. When I looked at the sample, it had 2 repeats of chart #4. So, I added 2 repeats of chart #4. I just barely made it, but I made it. I guess this speaks to the creative side of the monkey in me. There are certain aspects of patterns that do attract me: classic lines and timeless pieces. Something that you could wear today, or in 30 years from now. Something that you can pass on, and not trendy. I love long sleeves and short sleeves, and wear a lot of ¾ length sleeves as well, although they sort of fade in and out of fashion. I love accessories, as they knit up quickly and you can change them often. I have to admit, things that remind me of my childhood, or anyone’s childhood for that matter, I love. Currently, I’m wrapped up in trying to get not only things for others, but things for myself done. It’s less the challenge of the actual pattern for me, and always the challenge of time. Right now, I’m concerned about getting this test knit done, which is a great challenge – I’m following the pattern exactly. That for me is definitely a challenge. Then, I need to get working on some socks and other presents for Christmas, and a baby blanket for a friend at work. No, she has no idea it’s coming, and I want it to stay that way. I love being able to give to others, and right now, I am trying to give as much as I can. It’s exhausting, and that in and of itself is a challenge, as I have to carefully balance the giving to others with giving to my family. I never want to be one of those who will give the shirt off their back to a stranger, but won’t give to their own children. Much more in the days ahead – hope you’re having fun with this week!